This updated Enhanced Auto Scanner with CodeConnect, Trilingual, OBD II, CAN and Expanded ABS Coverage Scan Tool will revolutionize the way you fix your vehicle. It has been updated from over 3 million fixes to over 4.3 million verified fixes specific to the vehicle’s make, model, year and engine. CodeConnect provides actual fixes to the problem causing the check engine light to illuminate – providing the fix from the CodeConnect database. AutoScanner Plus will indicate on the screen which codes have the CodeConnect details available. Then it’s a simple push of the button to get the CodeConnect information. These actual vehicle fixes have been reported and then verified by Actron’s team of ASE certified technicians. 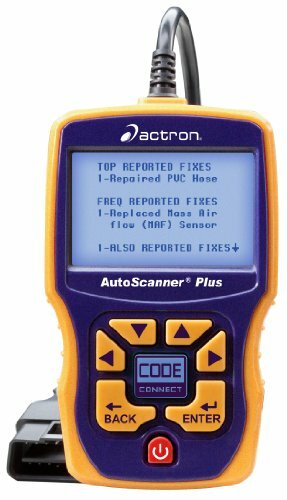 This Actron’s AutoScanner Plus includes domestic ABS code coverage and now includes Honda, Nissan, Toyota and Hyundai for 1996-2009 vehicles, record and playback data stream and on-screen graphing. 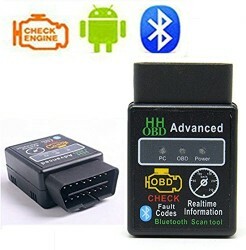 This AutoScanner with CodeConnect has the following new features: CodeConnect, record and playback live engine data, display live real time data, ABS code read/erase capability for most 1996 and newer vehicles, custom data list for live data, graph live data, displays all 9 modes of global OBD II data, and displays enhanced code definitions. 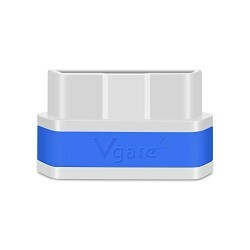 It has optional battery power, field updateable via USB port as well as the ability to print data to your PC. Other features include the ability to display OBD II generic and manufacturer specific codes and definitions on screen as well as read and display live engine data, MIL status, diagnostic trouble codes, I/M monitors (emissions), pending diagnostic trouble codes, freeze frame data (snapshot of vehicle data at the time of the fault), VIN number, CVN and CAL ID, state OBD check, code lookup library and OBD II drive cycle mode. 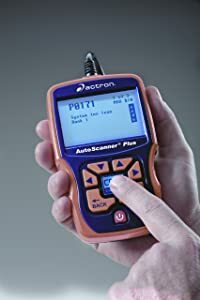 The Enhanced Actron CP9580A AutoScanner Plus OBD II, CAN & ABS Scan Tool is the ultimate choice in handheld automotive diagnostic scan tools. 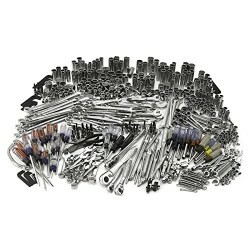 It is suitable both for advanced automotive do-it-yourselfers (DIYers) and automotive professionals alike. Not only does it capture and analyze data like other scan tools, but it also can help you prioritize troubleshooting with access to the most probable solution based on top reported fixes specific to the vehicle’s make, model, year and engine. Additional features include live engine data, graph live data, freeze frame data, drive cycle mode, print functionality and much more. Since the 1980’s standardized Onboard Diagnostic systems (first OBD-I and currently OBD-II) mandated for virtually all cars and light trucks manufactured for the US market have provided automotive technicians, and increasingly DIYers with insight into the increasingly complex inner workings of modern passenger vehicles. 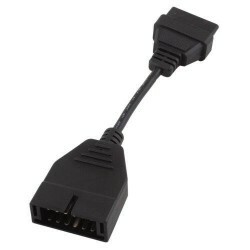 Traditionally professional grade diagnostic results required large and/or expensive scanning tools to translate diagnostic trouble codes (DTCs) and other data generated by the internal computer networks of your vehicle when the check engine/malfunction indicator light (MIL) on the dashboard goes off. 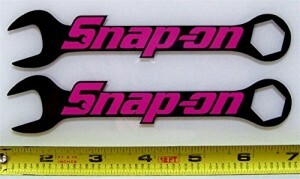 Now there is a much better way using the Actron CP9580A AutoScanner Plus Scan Tool. The Enhanced CP9580A AutoScanner Plus with CodeConnect does way more than just displaying the trouble codes and definitions seen in other handheld scan tools. At the touch of a button it can also actually help prioritize troubleshooting using the top reported fixes related to these codes, specific to your vehicle’s make, model, year and engine. Once codes register on the device, AutoScanner Plus indicates on screen which codes have the CodeConnect details available. To gain access to these possible fixes, all the user needs to do is push the CodeConnect button in the middle of the keypad and the most probable solutions according to the data on file will be displayed. CodeConnect is a comprehensive database of 4.3 million ASE verified fixes for the trouble codes that cause the check engine light to illuminate, providing a shortcut for troubleshooting efforts. Advanced functionality built into AutoScanner Plus also includes advanced domestic ABS code coverage allowing read/erase capability for most 1996-2010 GM, Ford and Chrysler and 1996-2009 Toyota, Honda, Hyundai and Nissan vehicles (click to see an ABS compatibility chart). Additional features include LIVE engine data, graph LIVE data, freeze frame data, drive cycle mode, updateable (via USB port), print functionality and much more. With over 40 years of experience manufacturing affordable automotive diagnostic tools, Actron features a product line that has something for everyone regardless of your level of experience. Check out the table below for current models of Actron scan tools available and their available features. Click the model number at the top of the table for further details. SPX warrants to the original purchaser of this product that it is free of defects in materials and workmanship for one year from date of delivery. This warranty does not cover any unit that has been abused, altered, used for a purpose other than that for which it was intended, or used in a manner inconsistent with instructions regarding use. A business unit of SPX Service Solutions, Actron has a 40-year tradition as a leading manufacturer of cost-effective, high-performance automotive diagnostic and test equipment. SPX Service Solutions designs, manufactures and markets a fully integrated family of global brands providing specialty service tools, advanced diagnostic and shop equipment, inspection and gauging systems, training and technical information for vehicle servicing and maintenance.